Hello readers of the African Peace Journal! My name is Chelsea and I am an Assistant Editor of Pencils for Africa, a website for middle school students based in California that is also founded by Karim Ajania, the founder and Editor-in-Chief of the African Peace Journal. The following is my interview with Alison Nicholls, an artist inspired by Africa, whose paintings are breathtaking! If you wish to visit the Pencils for Africa website to read interviews by my fellow students then kindly click here. When I was growing up I had no intention of being an artist. I enjoyed art but did not study it at school beyond the age of 13. Being an ‘army brat’ and having traveled widely at a young age, I was interested in international relations and history and these are the subjects I studied for my degree in the United Kingdom. It was when I moved to Zimbabwe in 1994 with my husband, that my interest in art was rekindled by the people, places & wildlife I saw around me. We moved to neighboring Botswana in 1996 and by the time we left Africa in 2002, I was well on the road to painting full-time. What kind of paints do you use and why? When I sketch in the field I use pencil and a field watercolor set, with watercolor paper. I don’t use an easel or chair so I sketch standing up, sitting on a fallen tree trunk or in a vehicle (especially when sketching wildlife). As a result, my materials have to be lightweight, quick-drying and easy to pack away, especially for those occasions when you have to move fast to keep up with your sketch subject! Back in the studio I use fluid acrylics on watercolor canvas. I dilute my fluid acrylics with water and build up layers of color, one on top of the other, in loose washes, generally adding detail only at the end. Why do you like to use vibrant colors in your paintings? Over the years I began to experiment with bolder colors and now this is a feature of my style. Although I want my people or animal subjects to be anatomically correct, I don’t see a need to use realistic colors, partly because I usually paint animals which are (hopefully) instantly recognizable. So instead I use color to create a mood – reds and yellows for heat and sun, purples and blues for shadow or dusk. Having said that, you do see amazing colors in parts of Africa like northern Botswana, particularly in the dry season, when there is a lot of dust in the air and the sun sets in a haze long before it reaches the horizon. This can lead to wonderful golden sunsets, glowing silhouettes and strong purple shadows. So perhaps my use of color is more realistic than it seems! What was it like to live in Africa? This is a question I have been asked numerous times over the years and I still struggle to answer it without writing an essay. But you did ask, so here is my answer! If you took a map of the world and cut out the United States, China, India, Europe, Argentina and New Zealand and rearranged them, they would all fit at once within the outline of Africa. So Africa is a massive continent and living in one part of Africa is very different to living in another. I lived in Zimbabwe and Botswana, two neighboring countries and yet they were incredibly different in almost every respect. In both cases I lived in the capital city – Harare in Zimbabwe and Gaborone in Botswana. Much of life was the same as you might expect anywhere in the world – I went to work in an office, bought food at supermarkets, ate out in restaurants and played sports on the weekends. Based on field research conducted in Zimbabwe by Dr Esther van der Meer, the above painting examines why African Wild dogs are choosing to leave the relative safety of Hwange National Park and live in the buffer zone surrounding the park where they experience more frequent fatal encounters with people. Yet, despite all the fairly normal things that were part of my daily routine, there were many times that reminded me I was in Africa – seeing warthog and the occasional spitting cobra while walking my dog; watching a herd of cows walk down the street past my house; buying a lunch of hot mealies (corn on the cob) freshly cooked over a fire; being woken by the neighbors chickens. There were colorful clothes, beautiful languages and ever-present music. Then there was the weather. I grew to love the smell of approaching rain, the storms that built up during the heat of the day then burst open with thunder, lightning, wind and huge drops of warm rain. And, of course, my husband and I loved to travel. We camped all over Zimbabwe, Botswana and Namibia, seeing amazing landscapes and an incredible amount of wildlife. It was the exposure to true wilderness, particularly in the Kalahari and Namib Deserts, which influenced my life and art in countless ways and it continues to draw me back again and again. If you could describe Botswana in one word, what would it be and why? This is a word often used in relation to the Kalahari Desert, which covers most of Botswana. It is very descriptive as the Kalahari is a vast, arid semi-desert. The first time I visited I was not all that impressed. It was hot, dry, very flat, covered in long grass and scrubby thorn bushes. For most of the day it was too hot to do anything, shade was meager, and there were few animals to be seen. But the Kalahari, like most deserts, reveals its secrets in its own time, and now the Kalahari is probably my favorite place on earth. I revel in the solitude of the place. I am amazed at the diversity of creatures that survive and thrive here including lions, giraffes, numerous antelope and birds. I am astounded by the night skies. I love the soft palette of desert colors – tawny grasses, pale sands and pastel blue skies. Most of all I enjoy the brief but beautiful sundown, the lengthening shadows and the emergence of honey badgers, bat-eared foxes, gemsbok (oryx) and springbok, all accompanied by a chorus of barking geckoes and the haunting cry of the black-backed jackal . It is pure magic. It will not surprise you to hear that for me, sketching in Africa is one of the most rewarding aspects of being an artist. It doesn’t matter if I am sketching wildlife at a waterhole in the bush, sketching people on the Maasai Steppe or driving through a dusty town – everywhere I look I see ideas and inspiration. And in a way, this is also the easiest part of what I do. I sketch whatever I see, whenever I see it. Apart from some basic ideas about where I’d like to go, there is little I can do to control what actually ends up in my sketchbook. Once my visit to Africa is over, it takes me some time to get back into my usual studio routine, because now I have to work for the ideas, they are not just appearing before me. People often assume that creating art is relaxing, that an artist works only when inspiration strikes and that the ability to create art is a ‘gift’ you either have or don’t have. I disagree with most of this because if you are a full-time creative professional you cannot rely on a gift, you cannot wait around for inspiration and you are more likely to be driven than relaxed! You may be doing what you love, but getting an idea from your mind onto canvas requires motivation and commitment, even on days when going into the studio is the last thing you want to do. For me, the constant work is what creates the inspiration, and in the studio I am rewarded by being able to create larger, bolder pieces of art than I can when I’m in the field. A working artist also requires many additional skills other than those required for the creation of the art. Once the art is complete, the administration and marketing skills come into play. The painting is varnished, photographed and the details are added to my database. I upload the image to my website, newsletter, blog and social media sites. Meanwhile, the original painting will be displayed in an exhibition. When it sells, I am able to make a donation to one of the African conservation projects I work with – another rewarding moment. 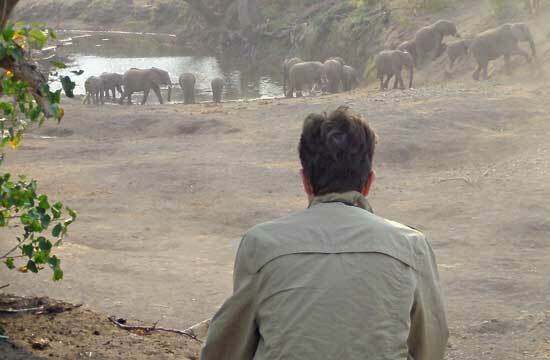 Meanwhile, the next tantalizing trip to Africa is always on my mind. Being an artist is a tough job but someone has to do it! Do you have a favorite painting or sketch? If so, why do you like it? I really don’t have a favorite, but there are certain recurring features that, for me, make a sketch or painting successful. These are simplicity in composition and execution, combined with a bold but limited palette of color. When all that comes together in one piece, I’m usually pretty happy! What was your most interesting experience in Africa and why? This is difficult to answer because I’ve had so many interesting experiences in Africa. Lions have walked past as we cooked dinner over our campfire in the Kalahari. African wild dogs have chased impala between our tents as we camped in the Okavango Delta. I’ve sketched in a Maasai engang (homestead) in Tanzania and watched a total eclipse of the moon in Zimbabwe (while a genet took advantage of the darkness to steal food from our campfire). A herd of over a thousand buffalo surrounded our tents as they made their way to the Chobe River (the same night that a honey badger tried to chew our truck tires!). I’ve spent time sketching the Maasai while visiting the African People & Wildlife Fund in Tanzania and I’ve joined Anti-Poaching Units on patrol in Zimbabwe with the Painted Dog Conservation (PDC) project. But perhaps one of the most interesting experiences was when I took this video, of an elephant calf being rescued by PDC staff from a trough in Hwange National Park in Zimbabwe. Why is African wildlife appealing to you? All wildlife is appealing to me, but I decided to concentrate on sketching and painting African wildlife species because I know many of them so well after spending countless hours watching and sketching them in the bush. This experience in the field is also vital back in the studio, where I compose my paintings without reference to photos or video. Very quickly, my interest in wildlife developed into an interest in conservation. My visits to conservation projects in the field allow me to sketch on site and see first-hand some of the complex issues facing people & wildlife in Africa today. As a result, many of my paintings now reflect conservation issues and I make a donation to African conservation from every sale. This painting shows the differing opinions often held about elephants by tourists and rural Africans. How did living in Botswana influence your life and artwork today? Zimbabwe was where I began to paint again, but Botswana was where my painting style began to develop. Space is an essential element of my compositions but it first began to appear in my work as I spent more time under the huge skies of the Kalahari Desert. As I became more familiar with the wildlife, I began to really appreciate the quiet times, when animals are relaxed and undisturbed, rather than seeking out the brief but dramatic moments of activity. This also found its way into my work and even now my subjects, whether they are people or animals, are usually relaxed, rarely looking at the viewer and are often walking away. Color, as I mentioned earlier, is also based on my African experiences. Although many places and people inspire me to paint, my knowledge of African wildlife is key. It sounds like a terrible cliché, but moving to Africa really was a life-changing experience for me as it set me on the road to a career in art. Had I stayed in the UK, I would probably not be painting and I might be spending my days in an office as a computer analyst. Guess which career path I prefer! explain a little about my Art and my time in Africa.